Jaafar says of his decision, “At only 19, I have time on my side to cement my racing skills in the most competitive, prestigious championship at this level. I have learned so much in the two years that I’ve been in this series and I want to continue learning in the most appropriate environment for me at this stage of my career. “I’m chasing the elusive first win in British F3 and I’m totally determined to achieve this in the coming season, as well as to improve further to finish in the top three. Of course, winning the championship outright is the goal and I have the motivation and experience to do this, as well as the team around me. 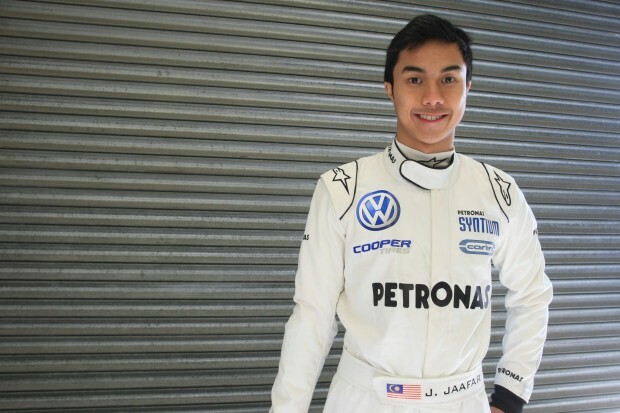 Jaafar began his career in karting at the age of 6, competing in his home country of Malaysia at the local tracks. He then progressed to Asian championships and on to Europe before stepping up to single-seaters six years ago. In his first season of racing cars, Jaafar took third in the Formula Renault Asia Championship and the following year, stepping up to Formula BMW Asia, he took the championship title with 10 wins, 16 podiums and 5 fastest laps. In 2008 Jaafar moved to Europe to race, competing in Formula BMW Europe for two years and then moving to the British F3 International Series. In the two years he has been competing in this championship, the recognised feeder series for future F1 stars, Jaafar has earned 6 podiums, moving ever closer to his first win. In 2011 the young Malaysian combined his British F3 campaign with competing in a new series, the FIA F3 International Trophy, which included Macau Grand Prix and F3 Masters at Zandvoort, two races which Jaafar competed in in 2010 as well. In his first season of the F3 International Trophy he finished a creditable seventh overall.